If you’re looking for a moving company that’s big enough to get any major task done, yet small enough to be sensitive and affordable, then you’re on the right page. 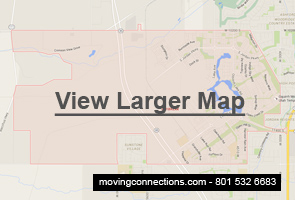 Moving Connections has been providing moving and shipping services along the Wasatch Front for more than three decades. Our primary interest is in serving the Utah community with local moves, but we are federally licensed, bonded, and insured for your security and peace of mind. Whether you’re looking for someone to perform a full service residential move, or would like to learn about our cost-saving “Labor Only” move, or you’re planning a business move, Moving Connections is the right moving service for you. You can click on the links below to learn about these different options, or you can call us to find out more and even get a quick rate quote for your job. If you’re looking for a full service residential move, then Moving Connections has a solution for you. With our moving crews made up of experienced professionals, Moving Connections will give you the most “bang for your buck”. When you order our full service move, two men will show up in a clean 26’ standard moving truck stocked with dozens of boxes, moving blankets, stretch wrap, and all the right equipment to do your job. They will wrap, pack, and load all of your household goods in accordance with the highest moving standards. At your new location, they will unload your items where you want them and even assemble and hook up items that require such services. If you need it, this professional moving team will even take items to a storage facility for you, and Moving Connections also has storage space, both climate controlled and regular. With a labor only move, the customers perform a major part of the service by packing many boxes themselves. Moving Connections’ professional moving crew still packages the very heavy and bulky items, and it still does all the loading, but you will do the driving and unloading. This can save a lot of money since Moving Connections charges by the hour. If you can cut an hour or two off of our professional moving crew’s time, you can save substantially. To learn more about this option, please give us a call or you can email us and one of our representatives will be happy to assist you with any questions you might have, including a rate quote for your job. When Moving Connections handles your business move, you’ll know you’re in good hands. Why? Because first of all, Moving Connections is federally licensed, bonded, and insured. Another reason for selecting Moving Connections to do your Daybreak business move is that all of the moving crew personnel are experienced professionals in the field before we hire them. An additional reason for using Moving Connections is that our pricing policies are clear and straightforward. We charge for driving and labor time, plus boxes and tape. You don’t get junk fees and phony taxes added on at any time, because we don’t charge them. And that includes fuel surcharges. We don’t charge them. Why take a chance on a moving company that’s not covered, or that hires their personnel from a home improvement center parking lot, or who will add 50% to their quoted estimate entirely with junk fees and spurious surcharges?